Angus Energy Plc (AIM: ANGS), a leading UK conventional oil and gas production and development company, announces that the Brockham X4Z well has been perforated from 960 metres to 1155 metres (an interval of 195 metres) measured depth. The objective was to initiate instant flow by perforating with a maximum underbalance of pressure between the reservoir and the well. During operations, several key completion components failed for a variety of reasons beyond the Company’s control. This also led to delays over the December and early January periods. These long-lead items have not been re-installed but rather engineering workarounds have been implemented, including a resort to lifting by injection of N2. Small quantities of oil of 40 plus API have now been returned to the surface and sampled in the returns and has been confirmed through analysis as Kimmeridge oil. Angus Energy is now putting together a further engineering program to isolate this water zone which will, subject to agreement from all regulators, include the return of a workover rig and the Company will update the market as soon as possible. 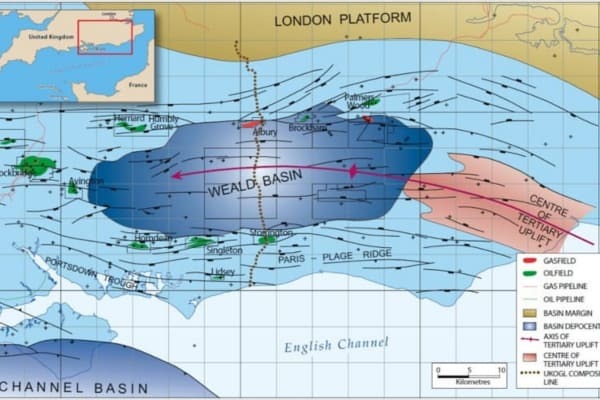 Extensive geochemical analysis and modelling of the Weald Basin conducted by and on behalf of Angus Energy, including innovative work on the effects of organic content on measurements of historical temperatures, indicates that the Kimmeridge is mature enough to produce oil over an area which includes Brockham.